Pago Pago International Airport ( IATA: PPG, ICAO: NSTU, FAA LID: PPG), also known as Tafuna Airport, is a public airport located 7 miles (11.3 km) southwest of the central business district of Pago Pago, in the village and plains of Tafuna on the island of Tutuila in American Samoa, an unincorporated territory of the United States. Hawaiian Airlines flights leave from Pago Pago International Airport 2-3 times per week. The airfield was first utilized on March 19, 1942 by U.S. Marine Fighting Squadron VMF-111  which arrived by ship from San Diego, California. VMF-111 aircraft were off loaded in Pago Pago harbor and trucked to Tafuna airfield. The first planes from MAG-13 also arrived at Tafuna Airfield on April 2, 1942 at which point they assumed responsibility for the air defense of American Samoa. Marine Torpedo Bombing Squadron VMO-151   arrived in early May 1942 at Tafuna Airfield where all three squadrons were based during the early part of the Pacific War. VMF-111 was eventually transitioned and based at Faleolo Airfield  in Western (British) Samoa after Faleolo airfield was completed in July 1942  to protect Upolu and Savai'i islands. 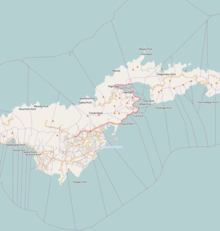 The original runway alignments were 09/27 (6,080 feet (1,853 m) x 500 feet (152 m)) and 14/32 (3,000 feet (914 m) x 200 feet (61 m))  and were constructed of compact coral with capability to handle 65 fighter aircraft and 12 medium to heavy bombers. The runways were lighted. The main terminal airfield buildings, a large hangar and control tower  were located at the edge of today's runway 08/26 and at what is today the Tafuna Industrial Park area. In conjunction with the airstrip at Tafuna, an emergency Bomber airstrip was also constructed in the village of Leone, known then as Leone Airfield in early 1943. It was situated on what is today Leone High School and Midkiff Elementary School on the western edge of Tutuila Island. Leone Airfield was 6,000 feet (1,829 m) x 500 feet (152 m)  and was completed on September 30, 1943. It had a short life during the war. The airfield was abandoned in early 1945 due to turbulent air currents and lack of use. Only two aircraft were recorded to have landed and taken off from the airfield. A visual outline of Leone Airfield can be seen from the air today with a straight clearance road starting from the WVUV-AM radio tower to Midkiff Elementary School. Pago Pago International Airport, as seen from A'oloau facing south, is on the left-hand side along the water. Pago Pago International Airport and the original Tafuna Airfield military facilities were first used for commercial trans pacific air service in November 1946 when Pan American Airways resumed service from Honolulu to Australia and New Zealand. Pan American utilized Douglas DC-4s, and eventually upgraded to Douglas DC-7C aircraft in 1956 (when Pago Pago International Airport was upgraded as a commercial airport) for its Honolulu / Canton Island / Pago Pago / Nadi / Auckland and Sydney route. This service was conducted using the outbased DC-7C aircraft Clipper Seven Seas N743PA  and Clipper Pacific Trader N744PA  on the route and continued until November 1965. It was also used for inter island air service between Faleolo, Western Samoa and Pago Pago in 1959 by newly formed, Apia-based Polynesian Airlines and short-lived, Pago Pago-based Samoa Airways using ex-military Douglas C-47B-45-DK ( DC-3D) type aircraft. Tasman Empire Airways Limited, or TEAL, the predecessor to what is now Air New Zealand, offered Douglas DC-6 (eventually using Lockheed L-188 Electra aircraft in 1960) flights from Nadi to Pago Pago   and onwards to Tahiti in 1954 as part of its Coral Route Service. Pago Pago International Airport went through major re-construction in 1963 under the U.S. President Kennedy administration. The WW II military-era runway designated 14/32 was converted to a taxiway and ramp area, and a new runway was constructed and designated 05/23 with a paved length of 9,000 feet (2,743 m) and width of 150 feet (46 m). New terminal buildings and tarmac ramp areas were also constructed. Runway designation 09/27 which was the primary runway for commercial air service in the 1950s and early 1960s was deactivated after the newer, longer runway 05/23 was open for aircraft flights. Pago Pago International Airport was opened to jet service in 1964 to stimulate tourism and a new local economy. A USAF C-141 at Pago Pago International Airport in July 1968. An Air New Zealand DC-8 is loading passengers in the background. South Pacific jet services between Sydney (Australia), Auckland (New Zealand), Honolulu (Hawaii) and Papeete (Tahiti) were first offered by Pan American World Airways in 1964 using Boeing 707 aircraft. Air New Zealand, which was already flying the Auckland / Nadi / Pago Pago / Papeete route using Lockheed L-188 Electra aircraft shifted to Douglas DC-8 aircraft in November 1965. In 1970 American Airlines  began flying the Honolulu / Pago Pago / Sydney route using Boeing 707 aircraft. UTA French Airlines began Douglas DC-10 service in 1975 between Noumea, New Caledonia and Papeete, Tahiti via Pago Pago. Continental Airlines also began DC-10 service from Honolulu to Sydney and Auckland via Pago Pago in 1979. Pago Pago International Airport went through its peak in aviation between 1975 and 1985. During this period Pan American (using Boeing 747s), Air New Zealand (using DC-8s), UTA French Airlines (using DC-10s), Continental Airlines (using DC-10s), Hawaiian Airlines (using a DC-8), South Pacific Island Airways (using Boeing 707s), Samoa Air (using a Boeing 707), Arrow Air (using a DC-8), Air Nauru ( Boeing 737 and Boeing 727), and Air Pacific (using a BAC One-Eleven) were all plying the South Pacific via Pago Pago. 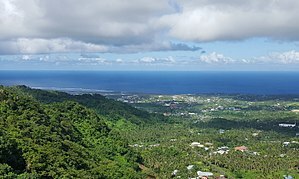 One could travel between Pago Pago and Honolulu for an airfare of US$99 one-way. Towards the end of its peak commercial passenger aviation period, Pago Pago International Airport also became an ideal refueling stopover for cargo carriers due to the low cost of fuel and landing fees at the time. Cargo carriers such as Kalitta Air, Evergreen International Airlines, and Polar Air Cargo would provide at least daily Boeing 747 cargo flights to Pago Pago from the US and from Asia Pacific between 1990 and 2006. The airport was a vital link to the Samoan Islands until the runway at Faleolo International Airport in Independent Samoa was improved and lengthened to handle larger than Boeing 737 type aircraft in 1984. With a population that is 3.5 times greater than American Samoa plus greater emphasis that was put on tourism growth, international airline traffic particularly from Australia, New Zealand and the South Pacific island countries began to shift from Pago Pago to Faleolo airport. 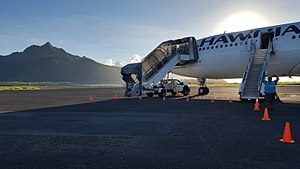 Airlines with flights from the US to Australia and New Zealand also started utilizing aircraft that did not require a refueling stopover in Pago Pago. By the late 1980s and due to heavy competition and economics, only one passenger air carrier (Hawaiian Airlines) remained to serve the Pago Pago trans pacific route. Runway 09/27 was the primary commercial runway for aircraft in the 1950s and early 1960s. The runway was deactivated after runway 05/23 was constructed and activated in 1964. In the mid-1970s, runway 09/27 was rehabilitated, repaved and reactivated as runway 08/26 with 3,800 feet (1,158 m) (length) by 100 feet (30 m) (width) to function as a secondary runway and taxiway. Runway 08/26 is widely used today by air taxi operators flying to Apia (Fagali'i and Faleolo), Ofu or Tau. To facilitate aircraft with large payload requirements and long distance flights, runway 05/23 was expanded in early 2001 from an original runway length of 9,000 feet (2,743 m) to the current 10,000 feet (3,048 m). Antonov 225 on final approach to Pago Pago International Airport Runway 5/23. 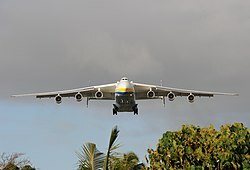 On October 13 and 19, 2009, the world's largest and heaviest aircraft, the Antonov An-225 landed at Pago Pago International Airport to deliver emergency power generation equipment  during the 2009 Samoa earthquake and tsunami. 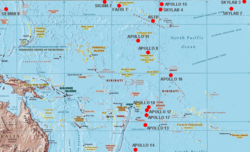 Locations of Pacific Ocean splashdowns of American spacecraft. Hawaiian Airlines is the only major airline serving Pago Pago International Airport. In 2004, with assistance from the American Samoan government to promote and bring additional air carriers to Pago Pago, Aloha Airlines opened a Honolulu / Pago Pago / Rarotonga route. However, the airline lasted 11 months and eventually pulled out of Pago Pago and other South Pacific routes it served due to financial issues. Daily inter-island flights between the Samoas are offered by Polynesian Airlines and Talofa Airways. The American Samoan government is looking into legal means to overcome current US cabotage rules that forbid foreign carriers from entering and serving the Pago Pago – Honolulu or Pago Pago – Los Angeles routes. There are regular buses that run between the airport and downtown. A new US$12 million Aircraft Rescue and Firefighting (ARFF) Fire Crash station was completed in 2005. A US$18 million Hot Fire/Crash Training facility was constructed and completed in 2008 and was to be used to train ARFF personnel, and other Fire Crash personnel from various airports in the South Pacific. In 2010, Pago Pago International airport underwent a US$1 million terminal remodeling and modernization with funding from the American Recovery and Reinvestment Act of 2009. The departure terminal, immigration, and Transportation Security Administration (TSA) security and lounge areas were completely renovated and expanded to handled more passenger capacity and flow. A new control tower is[ when?] in the planning and approval stage. Future plans also call for construction of a jet bridge to facilitate loading and unloading of passengers from large aircraft without being exposed to the weather. ^ a b FAA Airport Master Record for PPG ( Form 5010 PDF), effective June 21, 2018. ^ a b "(Page 148)" (PDF). Retrieved June 23, 2018. ^ "Building the Navy's Bases in World War II". Department of the Navy Bureau of Yards and Docks, Pg 208-212. Retrieved August 21, 2010. ^ "The U.S. Naval History of the Samoan Defense Group" (PDF). Lt. Commander John Buake, USNA. Archived from the original (PDF) on 25 July 2011. Retrieved 23 February 2011. ^ a b c d "History of U.S. Marine Corps Operations in World War II". Hough, Ludwig, Shaw - Chapter 3: The Southern Lifeline, pg 90. Retrieved February 16, 2011. ^ "National Register of Historic Places - American Samoa's Defenses: Blunts Point Battery". Erwin N. Thompson, Historian. Retrieved February 18, 2011. ^ "VMF-124 and VMF-151 Reunion Website". Retrieved February 18, 2011. ^ a b "Building the Navy's Bases in World War II". Department of the Navy Bureau of Yards and Docks, pg 212. Retrieved August 21, 2010. ^ a b "The U.S. Naval History of the Samoan Defense Group, pg 8" (PDF). Lt. Commander John Burke, USNR. Archived from the original (PDF) on 25 July 2011. Retrieved 23 February 2011. ^ "Tafuna Airfield bunker and tower WW II Photo with Mt. Matafao in background". Department of the Navy Bureau of Yards and Docks, Pg 208-212. Retrieved February 17, 2011. ^ Freeman, Paul. "Leone Airfield, Taputimu, American Samoa". Abandoned & Little-Known Airfields: Western Pacific Islands. Retrieved September 25, 2015. ^ "Pan American Clipper Seven Seas DC-7C (c/n 44885) / N743PA". Retrieved February 23, 2011. ^ "Pan American Clipper Pacific Trader DC-7C / N744PA". Retrieved February 23, 2011. ^ "Tasman Empire Airways Limited (TEAL) - Other routes". Retrieved February 18, 2011. ^ "TEAL - Coral Route". Webster's Online Dictionary. Archived from the original on 28 June 2011. Retrieved 18 February 2011. ^ "Timetables & Route Maps - American Airlines - September 14, 1970". Airchive. Retrieved February 2, 2011. ^ "An-225 Mriya, NATO: Cossack". Goleta Air and Space Museum. Retrieved February 25, 2011. ^ "Apollo 17 Lunar Surface Journal - Kevin Steen". Eric M. Jones. Retrieved February 23, 2011. ^ "Aviation Safety Network Pan American World Airways Flight 806". Aviation Safety Network. Retrieved January 1, 2009. 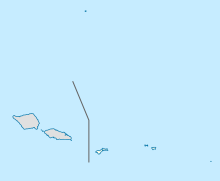 Wikimedia Commons has media related to Pago Pago International Airport.